Vinny “The Pazmanian Devil” Pazienza is a boxer with an unbelievable story. It’s not unbelievable because of the amazing fight he had with Roger Mayweather. It’s not unbelievable because of the WBA World Title he won against Gilbert Dele. And it’s not unbelievable because he stood toe-to-toe with one of boxing’s greatest champions, Roberto Duran, and was still standing when the final bell rang. No, it’s because Vinny Paz beat the odds after a terrible car crash, one that nobody in the boxing world thought he would come back from. Vinny Paz broke his neck, refused to stop fighting, and worked diligently to make a return to the ring. 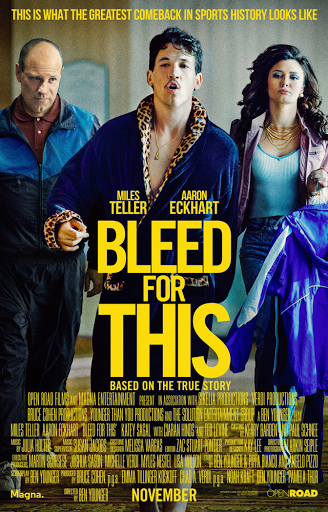 Director Ben Younger directs “Bleed For This” with a constant focus on the charismatic, arrogant Vinny Pazienza, played fiercely by Miles Teller. The film utilizes effectively many of the familiar themes boxing films have employed in order to display the fight of recovery Mr. Pazienza pursued. “Bleed for This” may not be as technically exciting or crowd pleasing like other boxing films, the journey for Mr. Pazienza is completely captivating. 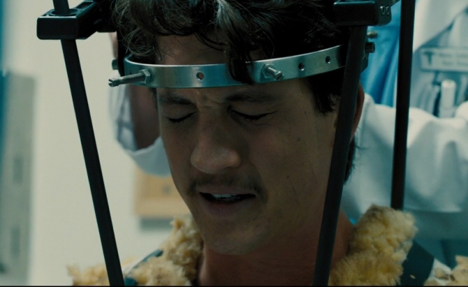 The film begins with Vinny (Miles Teller) desperately working out on a bicycle, his body wrapped in plastic. Vinny is trying to make weight for a big fight against the famed Roger Mayweather. Many boxing insiders, including his trainer (Ted Levine), believe Vinny's career is coming to an end after the fight. This doesn't stop the boxer who quickly finds a new trainer (Aaron Eckhart), a struggling alcoholic, who moves him up a weight class and makes him a contender again. At the peak of Vinny Paz's career as a boxer a terrible event takes everything the fighter has trained for away, placing the future of his fighting career in jeopardy. A few months ago a boxing film called "Hands of Stone", about the career of iconic Panamanian fighter Roberto Duran, was in theaters. Duran and Pazienza fought during the same time period, they also fought each other in a particularly classic match. What makes these films so different, and what highlights "Bleed for This", is the nature of the narrative. Both boxers have exceptional careers and have had classic matches but Vinny Paz has the story that feels more cinematic because it is so hard to comprehend the journey after his injury. A boxer with a broken neck makes a comeback and the first fight after injury is against an already established boxing legend, every punch has the potential for catastrophic consequences. For boxing fans all the moments that define boxing films are here. This helps and hinders the film, it helps when the complicated characteristics of a boxer are accommodated by a fantastic performance from Miles Teller and it hinders the film when fight scenes are composed exactly like everything we've seen before. Performances throughout the film are great, especially Miles Teller who really embodies the mannerisms and accent of Pazienza. Aaron Eckhart is also good, playing against the type that he is usually cast in. However, what makes these two performances excel isn't the fact that Mr. Teller composes a loud, brass, unapologetic character or that Mr. Eckhart is stepping outside of the comfort zone with a role, it's instead the combined relationship that the two actors compose as coach and athlete. The have an honesty with one another that is so true of the dynamic in athletics. "Bleed for This" is better than some of the other "based on a true story" boxing films. While the film may not have the spectacle of something like "Creed", it still composes a great character dynamic accommodated by great performances from Miles Teller and Aaron Eckhart. It displays the mentality and heart of a fighter, that no matter what odds are in their path, they refuse to acknowledge defeat.